Die Sabbati, videlicet, 16 Julii. Earl of Warwick's Letter to the Speaker, about the King's demanding The Lyon, and His Goods on board her. Thanks to the Earl of Warwick. Lieutenant of The Tower complains of a Building near it. Scots Commissioners desire Payment of the Eighty Thousand Pounds. 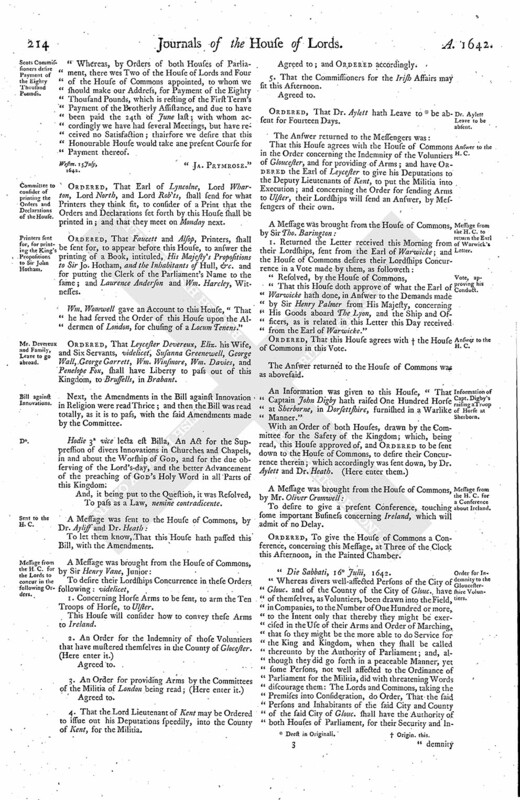 Committee to consider of printing the Orders and Declarations of the House. Printers sent for, for printing the King's Propositions to Sir John Hotham. Mr. Devereux and Family, Leave to go abroad. Message from the H. C. for the Lords to concur in the following Orders. Dr. Aylett Leave to be absent. Message from the H. C. to return the Earl of Warwick's Letter. Information of Capt. Digby's raising a Troop of Horse at Sherborn. Message from the H. C. for a Conference about Ireland. Order for Indemnity to the Gloucestershire Voluntiers. Order for a Provision of Arms, &c.
Order concerning storing the Arms in London, that came from Hull. An Order for apprehending Captain Digby. Order to the Mayor, &c. of Dorchester, to array and weapon, for Suppression of Attempts against the Town. Col. Butler Leave to go abroad with a Keeper. Message from the H. C. with an Order for storing the Arms from Hull. Committee of Safety to dispose of them. From aboard The James, in The Downes, this 14th of July, 1642. "Sir Henry Palmer told me, The King was resolved to have the Commission of Array put in Execution presently, in this County of Kent. I understand of a great Meeting this Day, at the Dean of Canterburie's House." Written to the Speaker of the House of Peers. This House approved of that which the Earl of Warwicke hath done; and Ordered, That a Letter be written from the Speaker, to give his Lordship Thanks for the same. This was sent down to the House of Commons, by Dr. Ayliff and Dr. Heath. Ordered, That Inigo Jones, the King's Surveyor, do view the said House, and make Report thereof to this House. 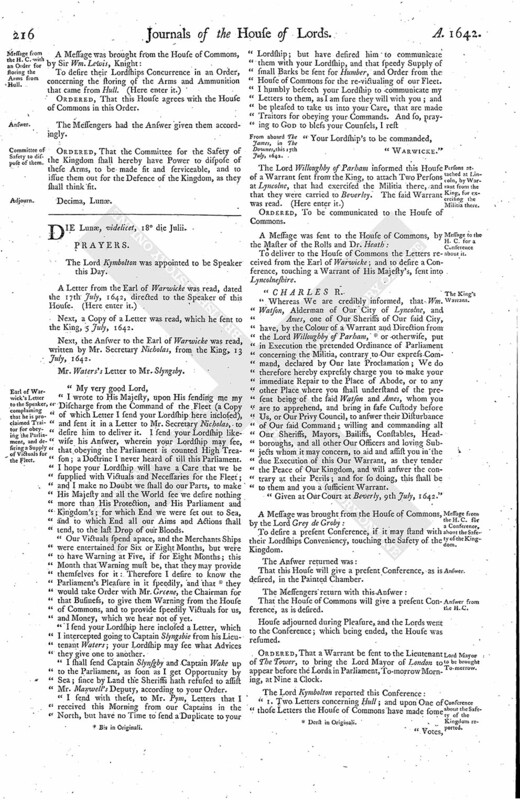 "Whereas, by Orders of both Houses of Parliament, there wes Two of the House of Lords and Four of the House of Commons appointed, to whom we should make our Address, for Payment of the Eighty Thousand Pounds, which is resting of the First Term's Payment of the Brotherly Assistance, and due to have been paid the 24th of June last; with whom accordingly we have had several Meetings, but have received no Satisfaction; thairfore we desire that this Honourable House would take ane present Course for Payment thereof. Ordered, That Earl of Lyncolne, Lord Wharton, Lord North, and Lord Rob'ts, shall send for what Printers they think fit, to consider of a Print that the Orders and Declarations set forth by this House shall be printed in; and that they meet on Monday next. Ordered, That Faucett and Alsop, Printers, shall be sent for, to appear before this House, to answer the printing of a Book, intituled, His Majesty's Propositions to Sir Jo. Hotham, and the Inhabitants of Hull, &c. and for putting the Clerk of the Parliament's Name to the same; and Laurence Anderson and Wm. Harcley, Witnesses. Wm. Womwell gave an Account to this House, "That he had served the Order of this House upon the Aldermen of London, for chusing of a Locum Tenens." Ordered, That Leycester Devereux, Eliz. his Wife, and Six Servants, videlicet, Susanna Greenewell, George Wall, George Garrett, Wm. Winsmore, Wm. Davies, and Penelope Fox, shall have Liberty to pass out of this Kingdom, to Brussells, in Brabant. Next, the Amendments in the Bill against Innovation in Religion were read Thrice; and then the Bill was read totally, as it is to pass, with the said Amendments made by the Committee. Hodie 3a vice lecta est Billa, An Act for the Suppression of divers Innovations in Churches and Chapels, in and about the Worship of God, and for the due observing of the Lord's-day, and the better Advancement of the preaching of God's Holy Word in all Parts of this Kingdom. To let them know, That this House hath passed this Bill, with the Amendments. 1. Concerning Horse Arms to be sent, to arm the Ten Troops of Horse, to Ulster. This House will consider how to convey these Arms to Ireland. 2. An Order for the Indemnity of those Voluntiers that have mustered themselves in the County of Glocester. 4. That the Lord Lieutenant of Kent may be Ordered to issue out his Deputations speedily, into the County of Kent, for the Militia. Agreed to; and Ordered accordingly. 5. That the Commissioners for the Irish Affairs may sit this Afternoon. Ordered, That Dr. Aylett hath Leave to (fn. 1) be absent for Fourteen Days. That this House agrees with the House of Commons in the Order concerning the Indemnity of the Voluntiers of Gloucester, and for providing of Arms; and have Ordered the Earl of Leycester to give his Deputations to the Deputy Lieutenants of Kent, to put the Militia into Execution; and concerning the Order for sending Arms to Ulster, their Lordships will send an Answer, by Messengers of their own. "That this House doth approve of what the Earl of Warwicke hath done, in Answer to the Demands made by Sir Henry Palmer from His Majesty, concerning His Goods aboard The Lyon, and the Ship and Officers, as is related in this Letter this Day received from the Earl of Warwicke." Ordered, That this House agrees with (fn. 2) the House of Commons in this Vote. The Answer returned to the House of Commons was as abovesaid. An Information was given to this House, "That Captain John Digby hath raised One Hundred Horse at Sherborne, in Dorsettshire, furnished in a Warlike Manner." To desire to give a present Conference, touching some important Business concerning Ireland, which will admit of no Delay. Ordered, To give the House of Commons a Conference, concerning this Message, at Three of the Clock this Afternoon, in the Painted Chamber. Die Sabbati, 16 Julii, 1642. Whereas divers well-affected Persons of the City of Glouc. and of the County of the City of Glouc. have of themselves, as Voluntiers, been drawn into the Field, in Companies, to the Number of One Hundred or more, to the Intent only that thereby they might be exercised in the Use of their Arms and Order of Marching, that so they might be the more able to do Service for the King and Kingdom, when they shall be called thereunto by the Authority of Parliament; and, although they did go forth in a peaceable Manner, yet some Persons, not well affected to the Ordinance of Parliament for the Militia, did with threatening Words discourage them: The Lords and Commons, taking the Premises into Consideration, do Order, That the said Persons and Inhabitants of the said City and County of the said City of Glouc. shall have the Authority of both Houses of Parliament, for their Security and In demnity for such their so Training already past; and that they may hereafter have a Warrant from the Lord Lieutenant of that City and County appointed by Ordinance of Parliament, or from some of his Deputies, to give them Power, in an orderly and peaceable Sort, to draw forth in Companies such as are willing to submit themselves to the said Ordinance of Parliament; and that they and their Officers, in a peaceable Sort, may train and learn the Use of their Arms at such convenient Times and Places as shall be by them thought fit for that Purpose." 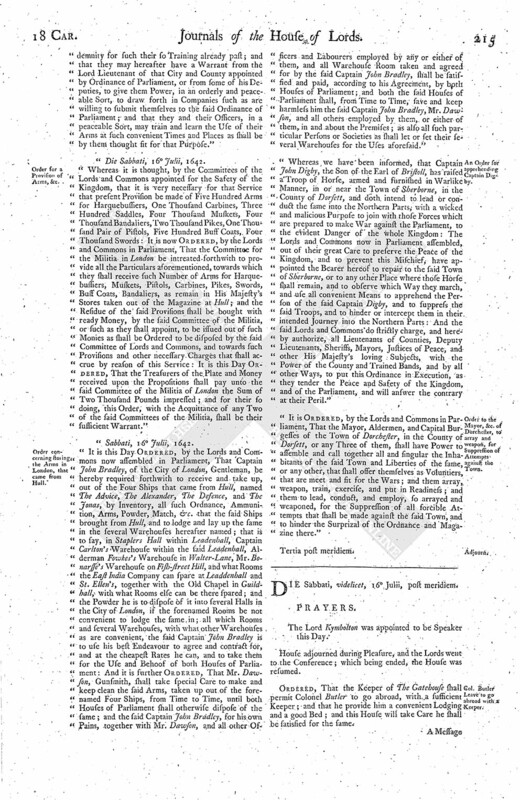 "Whereas it is thought, by the Committees of the Lords and Commons appointed for the Safety of the Kingdom, that it is very necessary for that Service that present Provision be made of Five Hundred Arms for Harquebussiers, One Thousand Carbines, Three Hundred Saddles, Four Thousand Muskets, Four Thousand Bandaliers, Two Thousand Pikes, One Thousand Pair of Pistols, Five Hundred Buff Coats, Four Thousand Swords: It is now Ordered, by the Lords and Commons in Parliament, That the Committee for the Militia in London be intreated forthwith to provide all the Particulars aforementioned, towards which they shall receive such Number of Arms for Harquebussiers, Muskets, Pistols, Carbines, Pikes, Swords, Buff Coats, Bandaliers, as remain in His Majesty's Stores taken out of the Magazine at Hull; and the Residue of the said Provisions shall be bought with ready Money, by the said Committee of the Militia, or such as they shall appoint, to be issued out of such Monies as shall be Ordered to be disposed by the said Committee of Lords and Commons, and towards such Provisions and other necessary Charges that shall accrue by reason of this Service: It is this Day Ordered, That the Treasurers of the Plate and Money received upon the Propositions shall pay unto the said Committee of the Militia of London the Sum of Two Thousand Pounds impressed; and for their so doing, this Order, with the Acquittance of any Two of the said Committees of the Militia, shall be their sufficient Warrant." 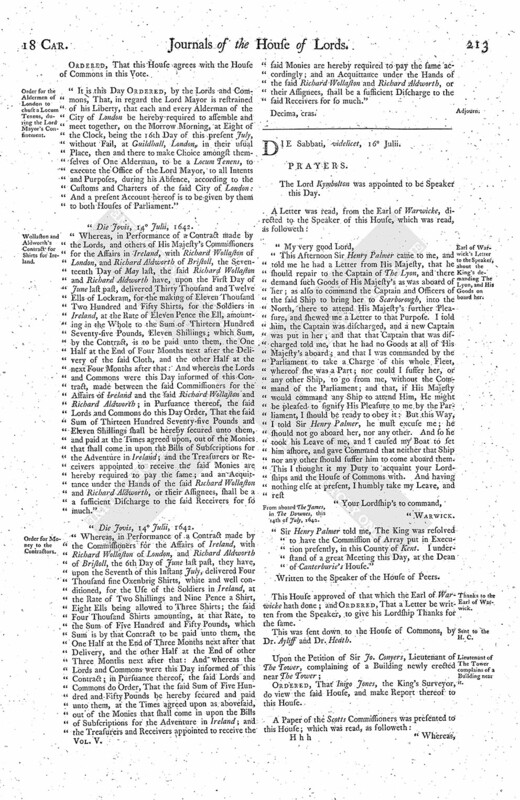 "It is this Day Ordered, by the Lords and Commons now assembled in Parliament, That Captain John Bradley, of the City of London, Gentleman, be hereby required forthwith to receive and take up, out of the Four Ships that came from Hull, named The Advice, The Alexander, The Defence, and The Jonas, by Inventory, all such Ordnance, Ammunition, Arms, Powder, Match, &c. that the said Ships brought from Hull, and to lodge and lay up the same in the several Warehouses hereafter named; that is to say, in Staplers Hall within Leadenhall, Captain Carlton's Warehouse within the said Leadenhall, Alderman Fowkes's Warehouse in Walter-Lane, Mr. Bonarsse's Warehouse on Fish-street Hill, and what Rooms the East India Company can spare at Leaddenhall and St. Ellen's, together with the Old Chapel in Guildhall, with what Rooms else can be there spared; and the Powder he is to dispose of it into several Halls in the City of London, if the forenamed Rooms be not convenient to lodge the same in; all which Rooms and several Warehouses, with what other Warehouses as are convenient, the said Captain John Bradley is to use his best Endeavour to agree and contract for, and at the cheapest Rates he can, and to take them for the Use and Behoof of both Houses of Parliament: And it is further Ordered, That Mr. Dawson, Gunsmith, shall take special Care to make and keep clean the said Arms, taken up out of the forenamed Four Ships, from Time to Time, until both Houses of Parliament shall otherwise dispose of the same; and the said Captain John Bradley, for his own Pains, together with Mr. Dawson, and all other Officers and Labourers employed by any or either of them, and all Warehouse Room taken and agreed for by the said Captain John Bradley, shall be satisfied and paid, according to his Agreement, by both Houses of Parliament; and both the said Houses of Parliament shall, from Time to Time, save and keep harmless him the said Captain John Bradley, Mr. Dawson, and all others employed by them, or either of them, in and about the Premises; as also all such particular Persons or Societies as shall let or set their several Warehouses for the Uses aforesaid." "Whereas we have been informed, that Captain John Digby, the Son of the Earl of Bristoll, has raised a Troop of Horse, armed and furnished in Warlike Manner, in or near the Town of Sherborne, in the County of Dorsett, and doth intend to lead or conduct the same into the Northern Parts, with a wicked and malicious Purpose to join with those Forces which are prepared to make War against the Parliament, to the evident Danger of the whole Kingdom: The Lords and Commons now in Parliament assembled, out of their great Care to preserve the Peace of the Kingdom, and to prevent this Mischief, have appointed the Bearer hereof to repair to the said Town of Sherborne, or to any other Place where those Horse shall remain, and to observe which Way they march, and use all convenient Means to apprehend the Person of the said Captain Digby, and to suppress the said Troops, and to hinder or intercept them in their intended Journey into the Northern Parts: And the said Lords and Commons do strictly charge, and hereby authorize, all Lieutenants of Counties, Deputy Lieutenants, Sheriffs, Mayors, Justices of Peace, and other His Majesty's loving Subjects, with the Power of the County and Trained Bands, and by all other Ways, to put this Ordinance in Execution, as they tender the Peace and Safety of the Kingdom, and of the Parliament, and will answer the contrary at their Peril." "It is Ordered, by the Lords and Commons in Parliament, That the Mayor, Aldermen, and Capital Burgesses of the Town of Dorchester, in the County of Dorsett, or any Three of them, shall have Power to assemble and call together all and singular the Inhabitants of the said Town and Liberties of the same, or any other, that shall offer themselves as Voluntiers, that are meet and fit for the Wars; and them array, weapon, train, exercise, and put in Readiness; and them to lead, conduct, and employ, so arrayed and weaponed, for the Suppression of all forcible Attempts that shall be made against the said Town, and to hinder the Surprizal of the Ordnance and Magazine there." "Ordered, That the Keeper of The Gatehouse shall permit Colonel Butler to go abroad, with a sufficient Keeper; and that he provide him a convenient Lodging and a good Bed; and this House will take Care he shall be satisfied for the same. The Messengers had the Answer given them accordingly. Ordered, That the Committee for the Safety of the Kingdom shall hereby have Power to dispose of these Arms, to be made sit and serviceable, and to issue them out for the Defence of the Kingdom, as they shall think sit.